As with all good things there comes a time when something overstays their welcome. For Prison Break that day came when season three hit the air waves. Debuting in 2007, FOX, like most networks, had the misfortune of being involved in the much publicized Writers Strike. This caused your usual 22 episode order to fall to 13. On paper that would be welcomed news as the Prison Break story would benefit greatly from a smaller episode order. The only issue was the season was equivalent to a tire being stuck in the mud. Season three picks up right where season two ended where we see Michael (Wentworth Miller), Alexander Mahone (William Fichtner), T-Bag (Robert Knepper) and Bellick (Wade Williams) stuck in a new prison called Sona. Meanwhile Lincoln, who is now a free man, is on the outside trying to get Michael out. But before he could even come up with a plan, the company kidnaps Sara and Lincoln’s son LJ. Thus forcing Lincoln and Michael to work with the Company in helping them break out fellow Sona inmate named Whistler (Chris Vance). What I will give season three credit for is its willingness to change up the roles for Lincoln and Michael. Usually where we would see Michael being the brains and Lincoln being the muscle. In season three, we actually see Lincoln having to use his smarts to combat Company operative Gretchen Morgan (Jodi Lyn O’Keefe). Now a big selling point for season three of Prison Break was the idea of having Michael stuck in a prison that was run by the inmates themselves. The idea of that alone is actually quite intriguing, but the Sona Prison itself lacked a sense of personality when compared to Fox River which had a wide open world with a long list of intriguing characters taking hold of that world. Sona seemed diminutive and for lack of a better word cheap. This prison which is decrepit and lacking simple fixtures like water and air conditioning, we still saw Michael each and every episode wearing a long sleeved t-shirt? Clearly it was to hide his tattoos, but to the story itself it just didn’t make any sense. 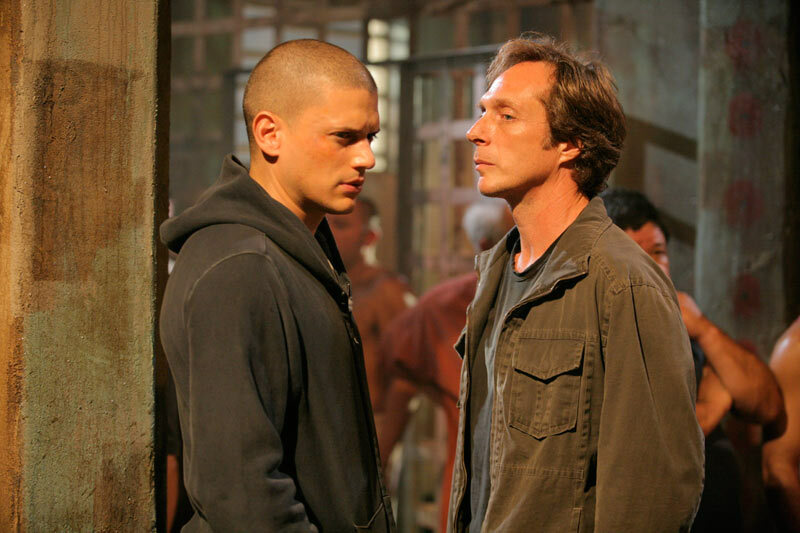 Aside from the Writers’ Strike, season three of Prison Break also saw itself having to replace a mainstay of the show from its first two seasons. That mainstay being Sara Tancredi (Sarah Wayne Callies). With Sarah in the midst of starting her own family, she remained absent throughout the entirety of season three, which left the show with no option but to kill off the character off screen. This was a hard pill to swallow for fans of the show as there was no heartfelt goodbye between Michael and Sara, whose romance we’ve followed for two years. To the show’s credit not all of season three was a disaster. The show made great strides with the Mahone and T-Bag characters. With Mahone we saw him teetering on the edge of sanity as his drug addiction reached its high point in season three. While with T-Bag we saw a new evolution to the character, where he tactically positioned himself alongside the toughest criminals of Sona. Even Bellick saw an evolution as well where we see him becoming a beggar and scavenger. Though I still believe that character should have been left to rest back in season two, that’s a discussion for another day. With a big part of the show revolving around breaking out Whistler, the Whistler character himself had mystery but zero depth or development. We knew he had a bird book with codes for a Company project named Scylla but aside from that we know nothing else. That lack of information is ridiculous for a character who holds that much importance for the entirety of the show. Now obviously we see Michael break out of Sona with Mahone and Whistler and to the show’s credit this breakout was much better thought out than that of season one. This season however had a knack for taking one step forward and two steps back. As after the escape we see Mahone deciding to team up with Whistler and the company which made zero sense. Not to mention we see Sucre who had helped Lincoln break out Michael getting imprisoned in Sona along with T-Bag and Bellick. All of those odd moves actually took away from what could have been a great cliff hanger, where we see Michael on a mission to kill Gretchen who had murdered Sarah. Clearly, season three of Prison Break faced an uphill battle with the Writers’ Strike and the departure of a beloved character. That however, doesn’t change the reality that season three of Prison Break was an absolute mess that began diluting the greatness of Prison Break.